The right nutrition for horses is very important. Your horse’s diet affects its health, condition and performance. The right food for horses is usually a selection of the right brok, muesli or cereal mix and the right composition of the feeds or the optimal ratio between several of these products. Hardly any attention is paid to the impact of the roughage. A horse or pony that doesn’t ride and isn’t in recreative activities or in light sports does not need large amounts of energy. A basic ration therefore consists of 90% roughage such as hay, pit grass or, for example, lucerne. As plants grow like grass, they contain more fibers. These healthy fibers stimulate the intestinal tract and are broken into bacteria by the large intestine. The volatile fatty acids released during this process are absorbed into the blood and then used as energy. This energy then slowly releases into the intestine, therefore doesn’t make a horse hot or nervous for eating this type of energetic food. A horse can even turn the fibers out of straw into useful energy. Of course, straw is not rich in building materials such as vitamins and minerals. Coarse hay made of mature grass plants yields less energy than young and tender grass. Fiber rich roughage such as hay, luzern and straw also cause the ration to flow smoothly through the gastrointestinal tract. The intestines remain active with a rich ration and the horses chew a lot. 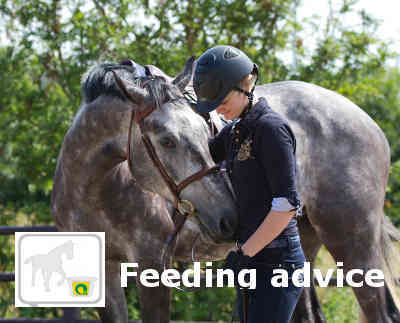 Horses do not get fat quickly or temperamental from rich-structure feed. Wet pit contains a large percentage of water and has less fiber than hay. An addition of a fiber rich mélange such as Hartog Lucerne-mix increases the proportion of fiber in the ration and enriches it due to the naturally occurring vitamins and minerals. Long, dry and very stallable hay contains plenty of fiber but is often poor in protein and vitamins because of the lack of fertilization. This leads to shortcomings especially in winter. An artificially dried product such as the Hartog Gras-mix or Compact Grass offers results. Due to the drying process, the vitamins remain well, which support the natural resistance of the horse. Does your horse need something extra? Even recreational horses can sometimes use some extra things. After a long outdoor ride, a cold period or during the recovery period, the horse is supported with concentrate feed. A muesli like the Hartog Balance horse muesli contains a low sugar and starch content. This muesli has a well-balanced ratio between naturally shaped vitamins and minerals. This will optimally support the horse's health, vitality and resistance. Hartog’s horse feed is high quality, tasty for your horse and hygienically packaged. Our feed is used in the recreation, breeding and all sporting disciplines of the horse.